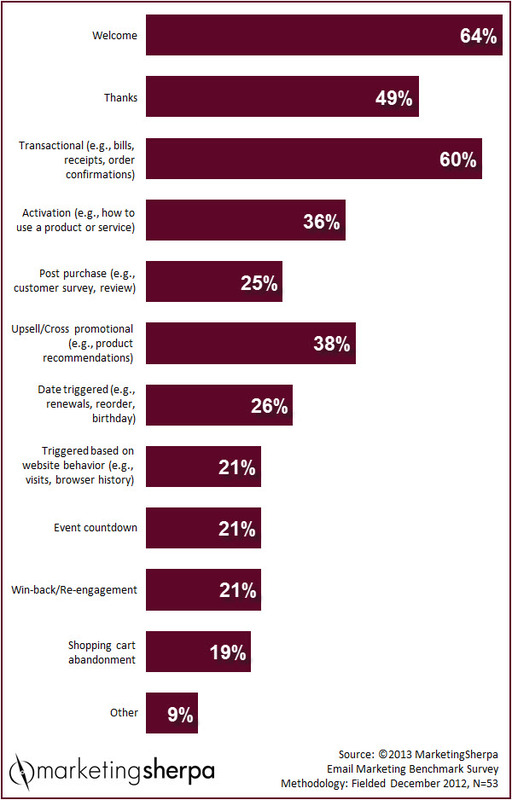 Marketing Research Chart: What is the only type of email your customers will actively miss? SUMMARY: 'Tis the holiday season. Marketers are doing everything in their power to compensate for a late Thanksgiving and customers who are reluctant to spend. There's one type of email your customers actually, actively want from you that 40% of consumer marketers are not using. Read this MarketingSherpa Chart of the Week to discover what that email is. If you stopped sending promotional emails, would the majority of your customers actively notice? Would your customers even contact you because they missed them? What about email newsletters? Other than a few exceptionally well-written and helpful newsletters, customers probably would not notice. But, I would argue transactional emails are the golden ticket — especially for e-commerce marketers during the holiday season. Q: What type of automated, event-triggered, lifecycle email messages does your organization deploy? Please check all that apply. If transactional emails are your "in" to a few dedicated moments with a customer, how can they help your marketing? If you see them only as bills, receipts or order confirmations, you are missing the big picture. They offer secondary real estate for a relevant call-to-action around this primary information. You can craft an offer based on that customer's value to your organization. RFM — recency, frequency and monetary value — is marketing 101. For every transactional email you send, unlike promotional emails, you likely have or can gain access to at least some of this information. But don't overstay your welcome. I hate to use the Trojan horse analogy because, in a sense, it implies disingenuous motives. As with all marketing, to be truly effective, you have to put the customer first. Relevance is key. After all, these are your customers. The last thing you want to do is abuse the trust they've placed in your company by making a purchase. If you are able to craft a relevant call-to-action around transactional information, you are adding additional value for your customers. "Here's the confirmation that your partridge has arrived. Where will you put it? Do you now need a pear tree?" "Well, we see you bought a menorah. As a valued customer, we can send you the Hanukkah candles with free shipping." If you include random marketing messaging that doesn't apply, you will likely be less effective. But, it probably won't hurt your relationship with the customer too much, as long as the marketing message is not intrusive. If, however, the marketing message is not secondary to the transactional info, you are no longer comfortably ensconced in your Trojan horse — you have burned a bridge. Some marketers see the opportunity, like this agency marketer who responded in the benchmark survey by saying, "It was really hard to narrow it down to one thing. We have been depending mostly on promotional and informational emails sent out on a schedule; we're going to try to talk clients into doing more with transactional emails." A B2B/B2G (business to government) marketer intended to "use transactional streams for promotional, more event trigger-based programs." Otherwise, 100% of email marketers would be doing it. A B2B/B2G marketer mentioned some of these challenges in the benchmark survey. "Because transactional is a major communication stream, managed outside normal email marketing channels, and integration of promotional with transactional presents CAN-SPAM compliance challenges, as well as analytics challenges (i.e., we don't have permission, interaction analytics on many transactional recipients)." So start small. Maybe you can add dynamic offers with pictures, but what about grouping your products into a few broad categories, and adding a simple line with a link for a complementary product and service? Could you accomplish this in time to impact sales for this holiday season?